Customized & Automated Invoicing App for your Shopify Store! Invoice4Shopify gives you full access to create your own branded invoice template. Send beautiful designed and fully automated Invoices to your customers email, including downloadable PDF format for print. Edit Colors, Taxes, Shipping Costs, Discount Details and much more. Invoice4Shopify covers all of your Invoicing needs! Click to start your Free Trial ! Custom templates enable to set up your own branding. Support both Right to left & Left to right orientation. Fully Customized Texts & Languages. Your own HTML template implementation ability by demand. Invoice Editor make it easy to edit Invoice details & Send to it your customer. Integrated Invoice Calculator supports all Taxation Modes. Send Designed HTML Invoices with downloadable PDF format. Invoice Search Box help you to find and organize your Invoices. Edit and Send Invoice links from your Order page at Shopify. 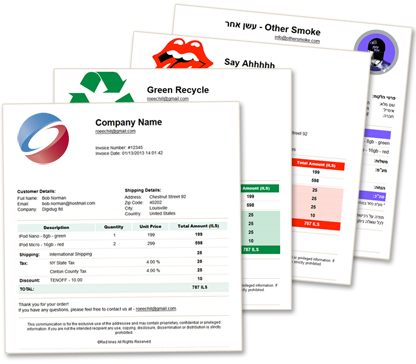 New Bulking Tools - Print and Download your Invoices in bulk. New Custom Message - add a note to your customer invoice email when editing your Invoice. Choose how and when do you want your Invoices to be sent. With our both Automated Modes - Invoice will be sent to your customer email for each order coming to your Store. Manually - Send Invoices on demand. Automatically when Order is Fulfilled. Even when you finish your 14 Days Trial period, you still have 10 Invoices per month - For Free!! !